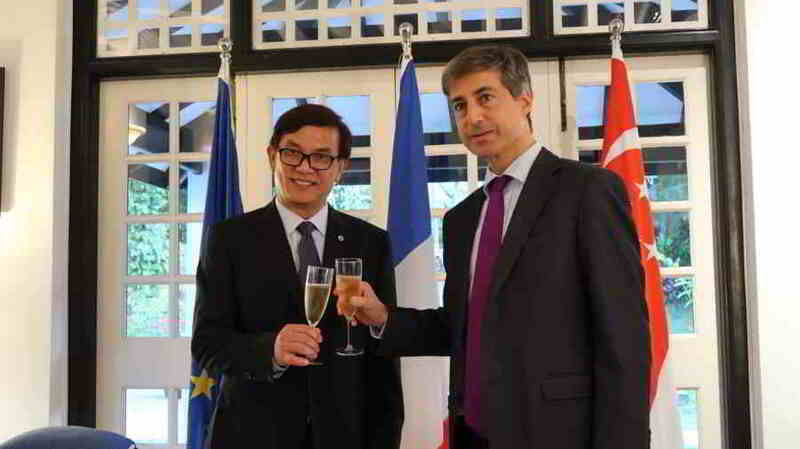 Singapore, 8 July 2017 – Robin Yap, Asia President of The Travel Corporation received the prestigious Gold Medal for Tourism (“Médaille d’or du Tourisme”) from Atout France, the France tourism development agency, on 7 July 2017. 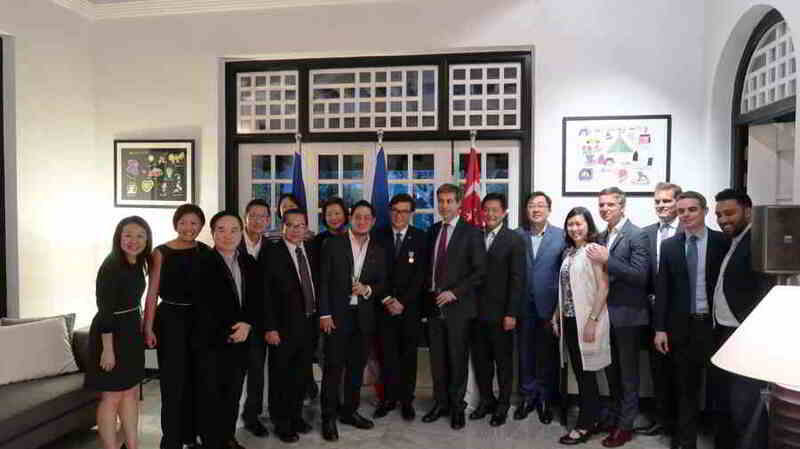 The award was presented by His Excellency Marc ABENSOUR, Ambassador of France to Singapore at his excellency’s residence. Operating in 60 countries, The Travel Corporation (TTC) is a highly successful international travel group with over 25 award winning brands. These include Insight Vacations, Trafalgar Tours, Contiki Holidays, Uniworld Cruises, Thompson Gateway Africa, Red Carnation Hotels and other leisure interests. The Tourism Medal was created in 1989 and is the most prestigious token of recognition awarded by the French Tourism Industry. It is described as an honorary award for outstanding and valuable professionalism, either in France or abroad, to those who have contributed throughout their career to the development of tourism in France. The medal is awarded to individuals either in France or abroad, and Robin Yap is the second person in Singapore to receive this honour. “I am deeply honoured to receive this prestigious award from Atout France and from His Excellency Marc Abensour, Ambassador of France to Singapore. I am a firm believer that Tourism plays a key role in promoting mutual understanding and respect between countries. At The Travel Corporation (TTC), we understand that travel matters and we are deeply passionate about sharing our love for travel. Through enriching experiences, our guests can gain a deeper understanding of each destination, learning about history, culture and cuisine of the people they meet along the way,” said Robin Yap, The Travel Corporation, Asia President. We also recognize that it is our responsibility to protect the places we visit and take care of the world around us. Hence, we established TreadRight Foundation, a not-for-profit organization that works to help ensure the environment and communities we visit remain vibrant and preserved for generations to come. To date, TreadRight has supported more than 40 sustainable tourism projects worldwide. Therefore, promoting tourism is definitely not a one-man show and I humbly receive this award on behalf of The Travel Corporation and all my travel agency partners in Singapore.” added Yap. Robin serves as a member of the Advisory Council of Pacific Asia Travel Association’s (PATA) Singapore Chapter and member of Outbound Travel Committee of National Association of Travel Agents (NATAS). He is deeply passionate about sports, and counts bowling and cycling as his two favourite sports. Robin is currently Chairman of Singapore Bowling Pte Ltd, a business unit of Singapore Bowling Federation and Resource Advisor of Singapore Bowling Federation, which seeks to promote bowling in Singapore. Robin is active in community work and has volunteered with several grassroots committees. He is currently serving his seventh term as District Councillor of the Northwest Community Development Council of Singapore and is Patron of the Canberra Community Club Management Committee. Robin was conferred the Pingat Bakti Masyarakat (Public Service Medal), PBM by the President of Singapore in 2010, and a Community Long Service Medal in 2015 by the Mayor of the Northwest District for rendering commendable public service in Singapore.